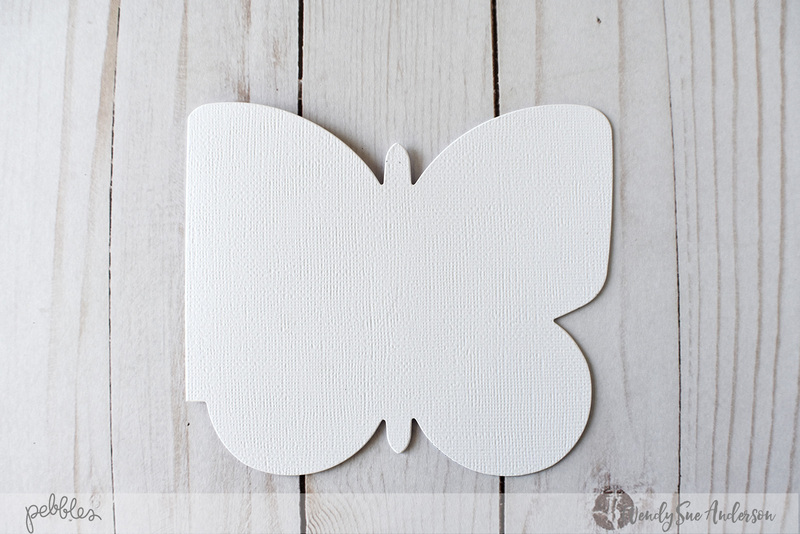 Mother's Day Archives - Pebbles, Inc.
Start by creating a butterfly shaped card base. 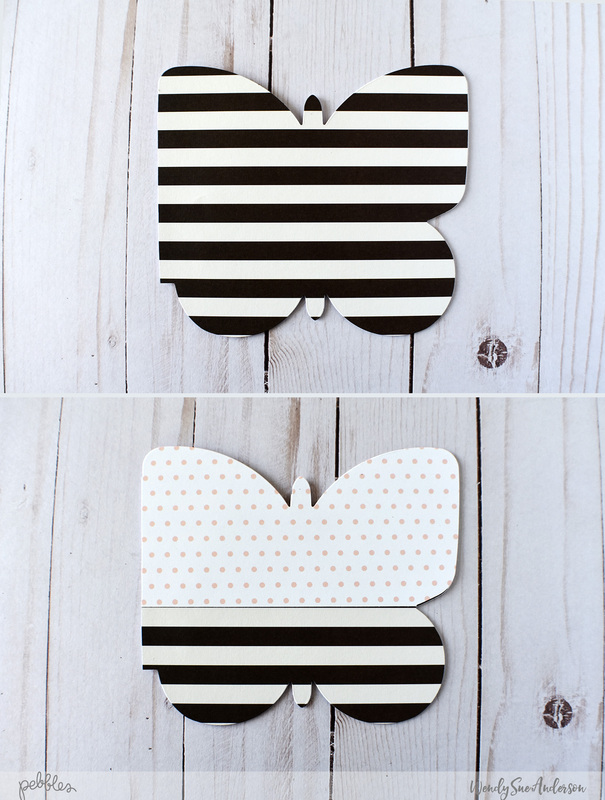 You can use a digital cut file, a metal die, or even find a simple template online and cut it out by hand! See? I told you it was quick and easy!! 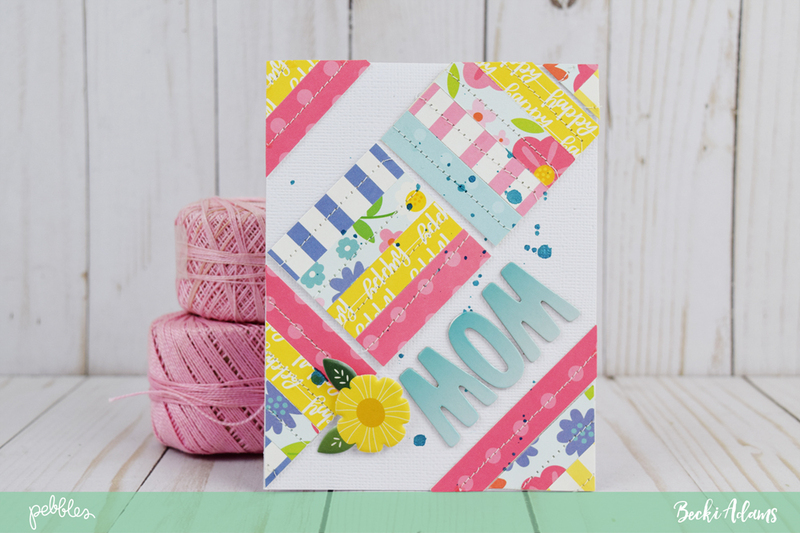 If you’re lucky enough to have a mother-in-law, a bonus mom, or someone else to celebrate on Mother’s Day, whip up another card or two using the same instructions, but choose different papers! It’s fun to mix and match! Hello lovely Pebbles friends. 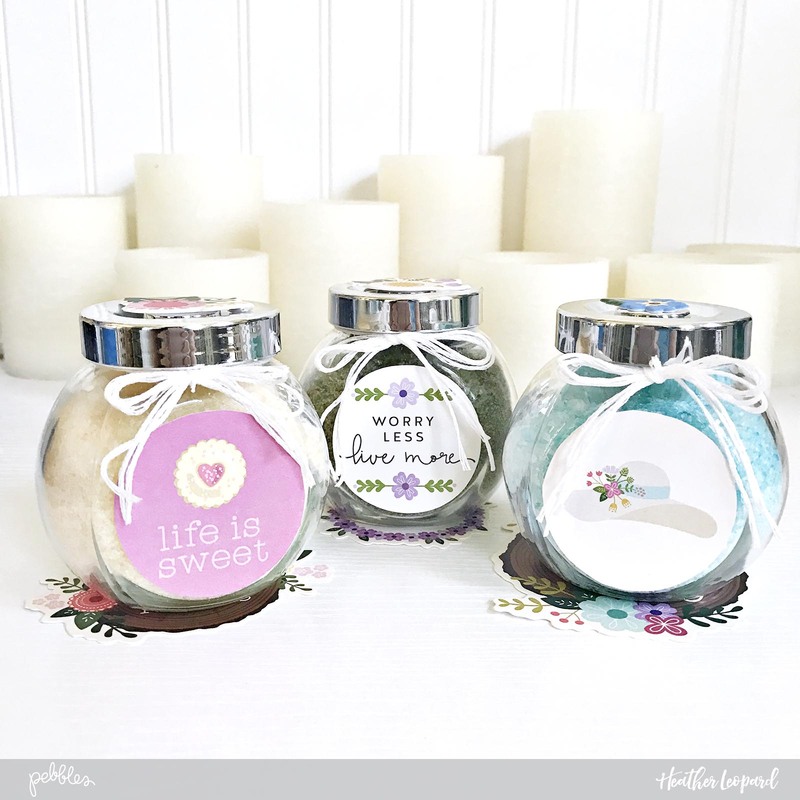 Heather Leopard is here today to share a pampering DIY Mother’s Day idea. This is a perfect way to treat any guests you welcome to your home for this weekend’s celebration, or any time for that matter. It’s also a sweet idea for those moms who may be a bit hard to buy for. Or, maybe you just want some time to yourself. Either way, this DIY project is sure to please! 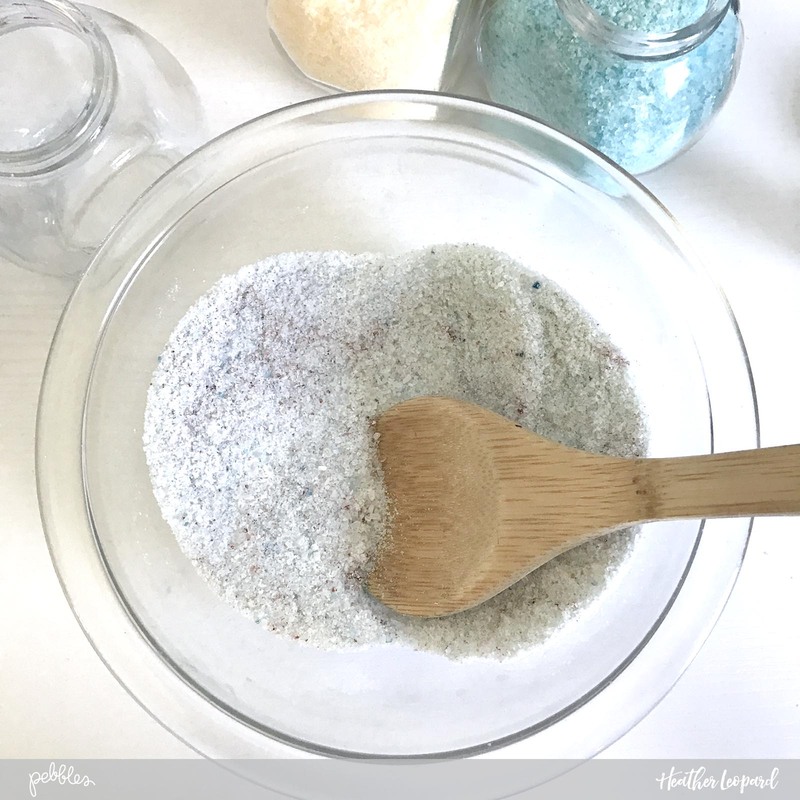 Not only do these DIY Mother’s Day bath salts add an extra spa-like element to your bathroom, they are also fun and easy to make! 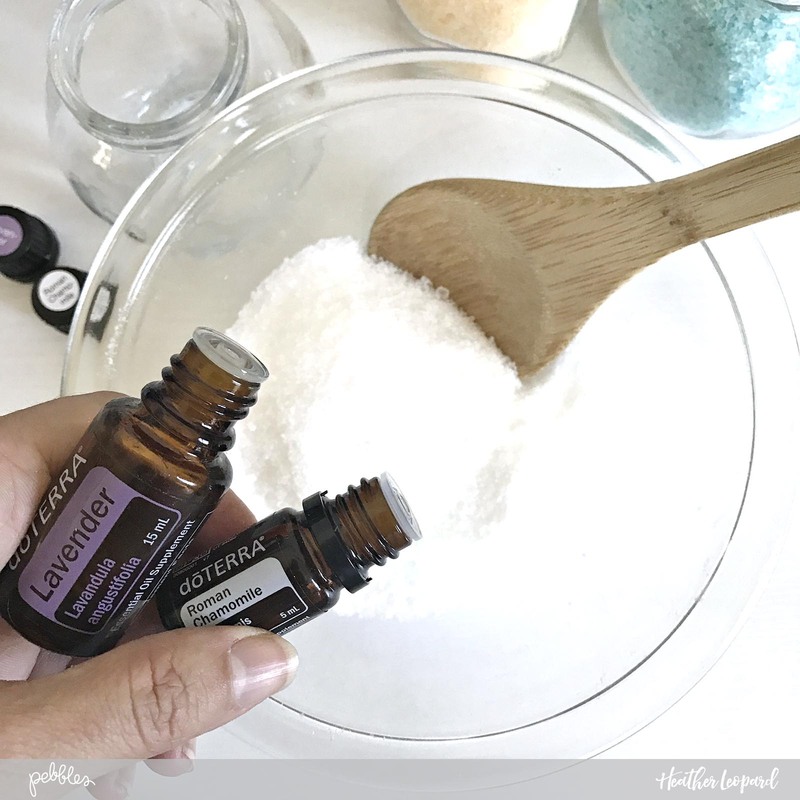 6 – 8 drops of your favorite essential oils – consider lavender, peppermint, citrus, geranium, frankincense, chamomile, or your favorite blends. Food coloring (optional) If you do not add food coloring, the bath salts will be white in color. Begin making your DIY Mother’s Day gift by adding all ingredients together in a medium mixing bowl; stir together until well blended. 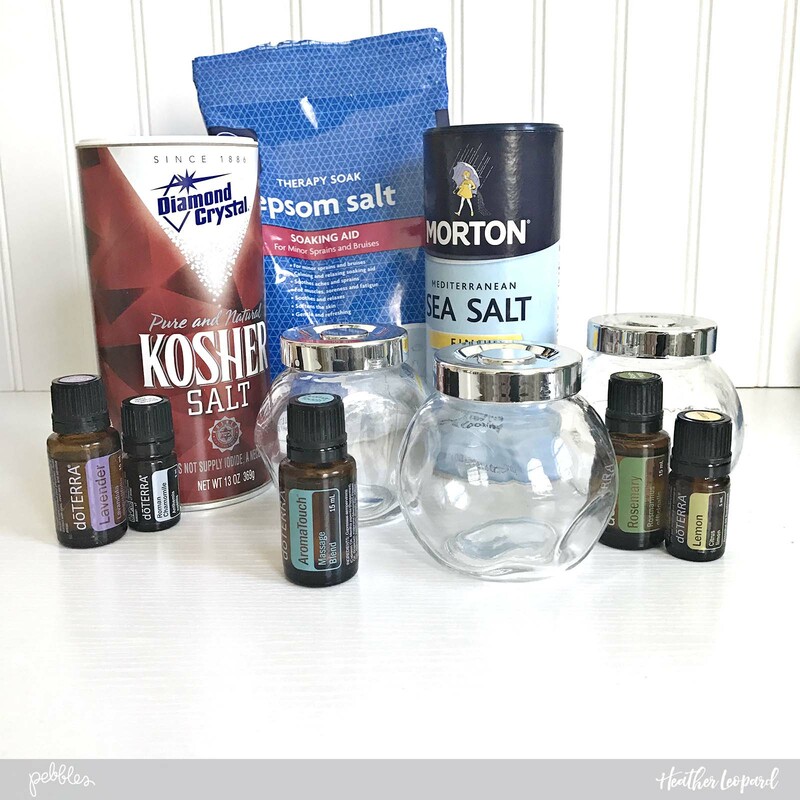 If you choose to use multiple scents, mix everything but the oils together. Split the mixture into separate smaller bowls. Add the oil or oil blend of your choice. 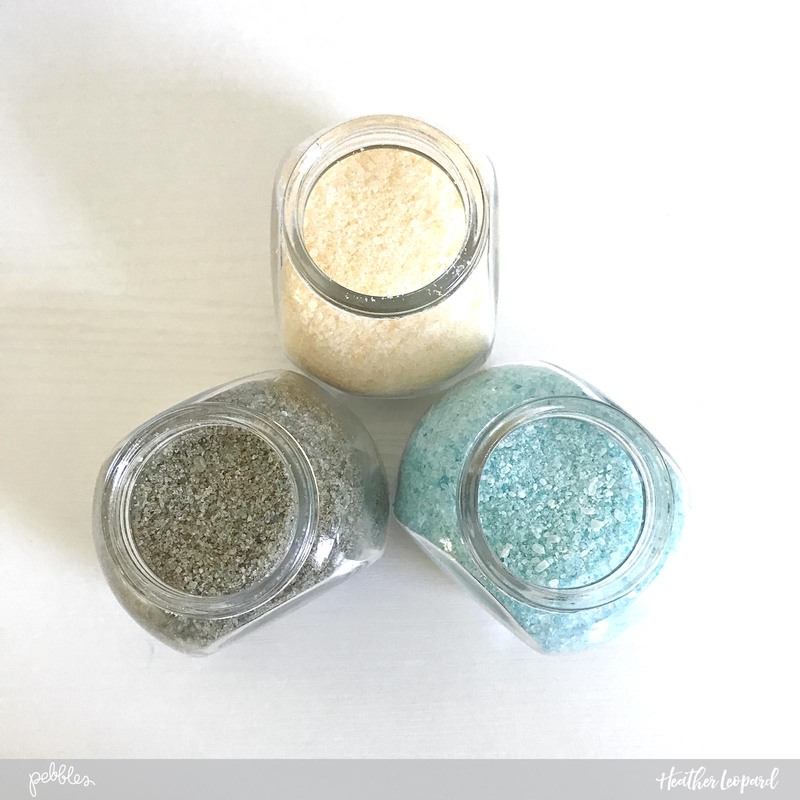 Add a few drops of food coloring if you choose to add color to your salts. 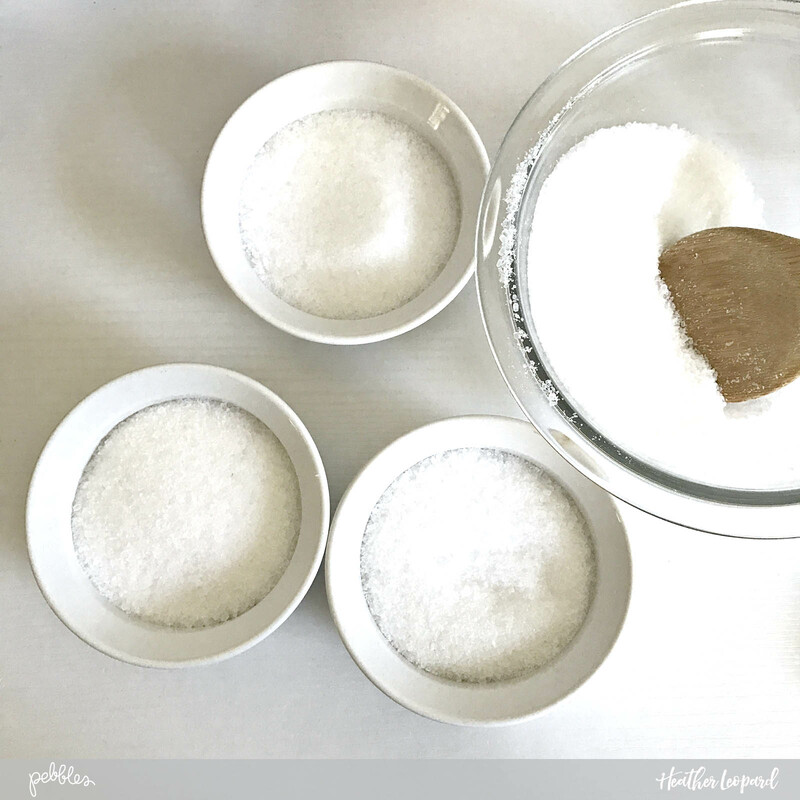 Once dry, add the salt mix to your containers. Store in airtight container for up to 6 months. Lastly, add a little note and pretty bow to make them pretty. 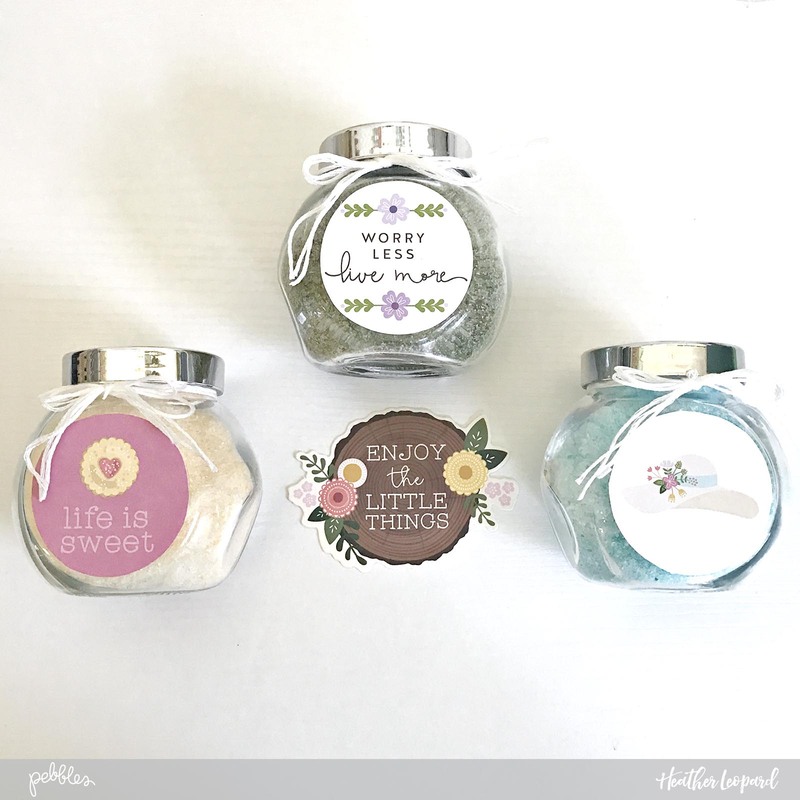 I used these from the Tealightful collection. 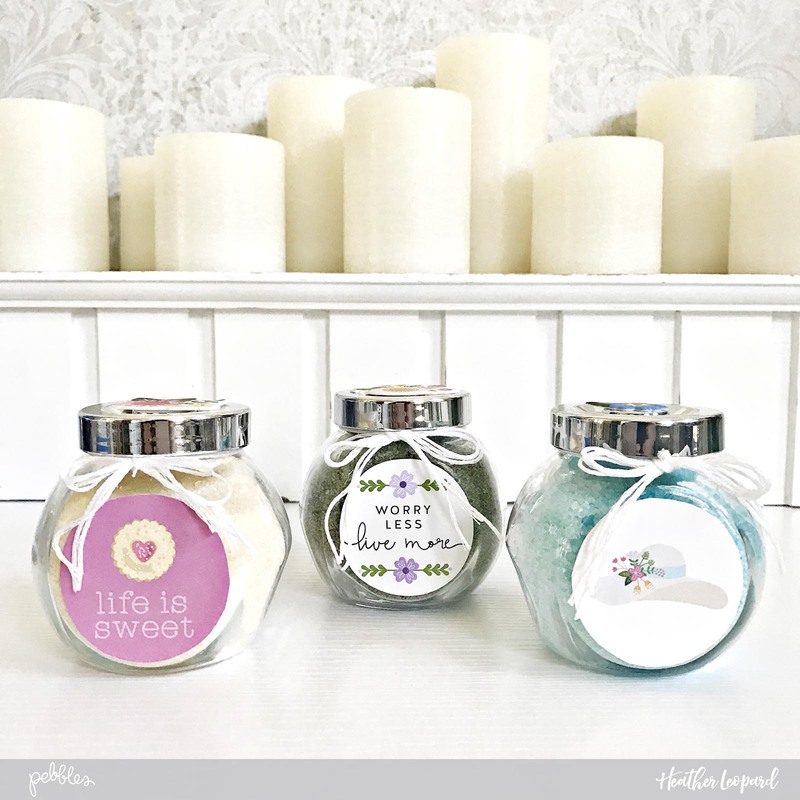 Display in your bath and you’re all set to relax! Just turn on your favorite spa music and get ready to tune out the rest of the world for the next 30 minutes. Fill the bath with warm water and add 2 – 3 scoops (approx. 1/4 C.) to the warm bath. Enjoy pampering yourself! 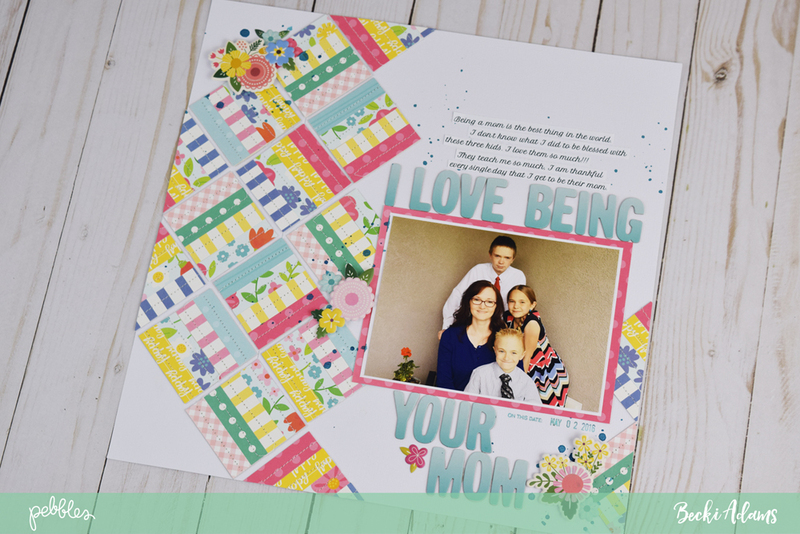 Hey there Pebbles friends and fans, Becki here to share with you a fun quilted Mother’s Day layout and card set that I created with a combination of the TeaLightful collection, the Sunshiny Days collection, and the Lullaby collection. 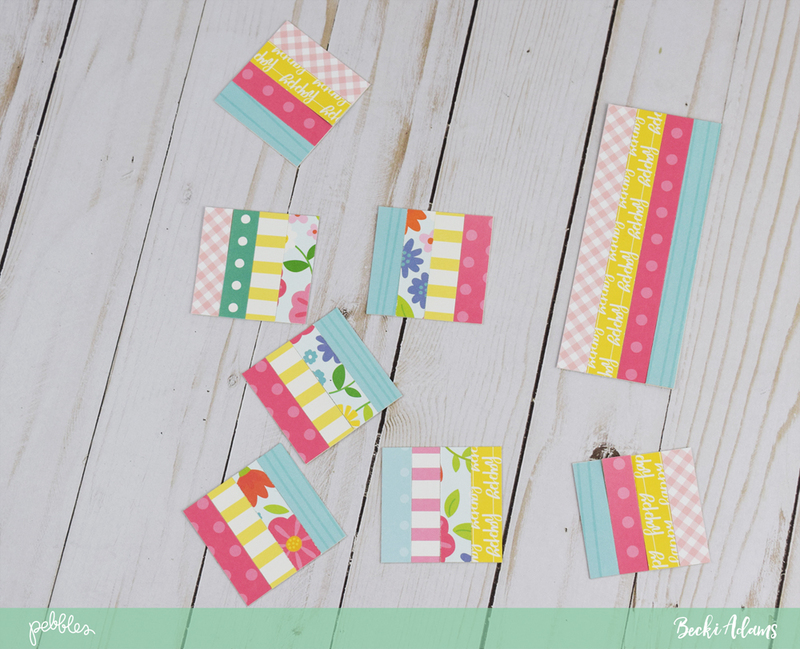 I chose bright patterns that mostly had smaller tone on tone prints, as well as some of the branding strips from the patterned papers. 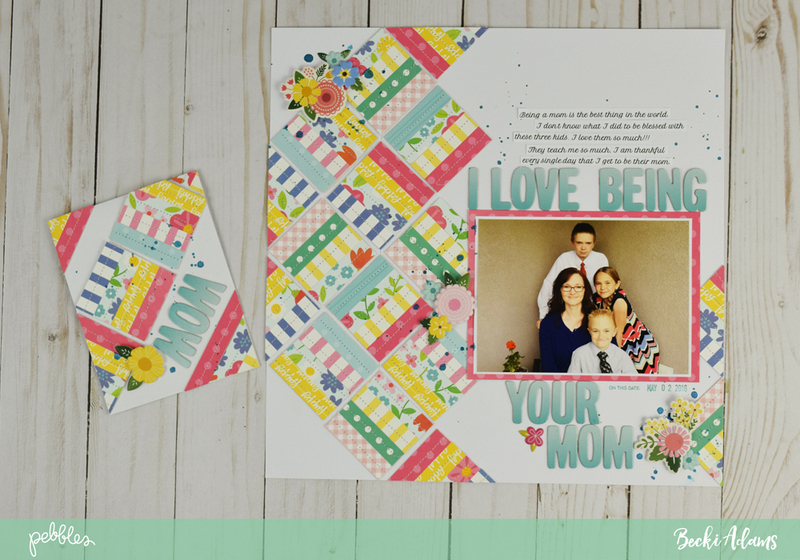 White cardstock was my base for both the Mother’s Day layout and the card. I wanted a blank slate to showcase the fun quilt blocks. When I began this project, I wasn’t intending to create a card but I had a few bits and pieces left from the quilted pieces I created for the layout. 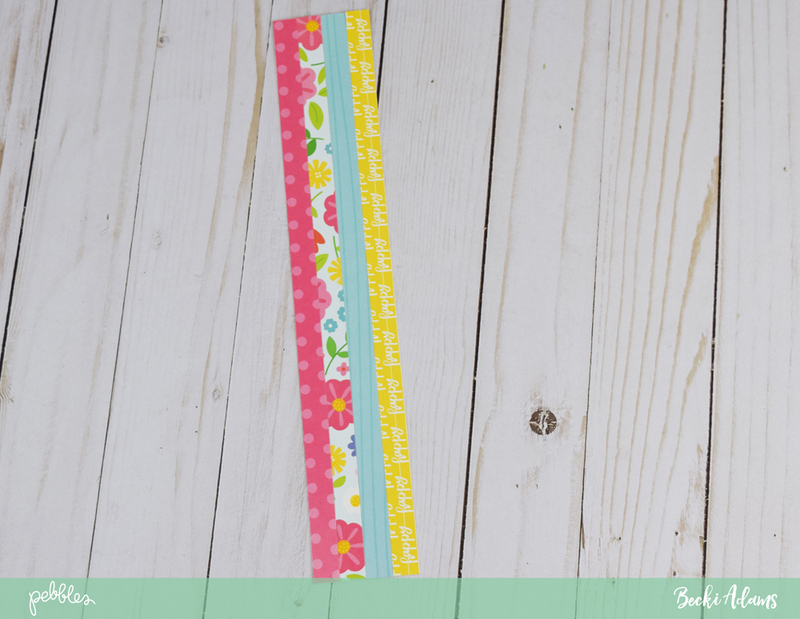 For the Mother’s Day layout, I began by cutting lots of 12×2 strips of patterned paper. Then, I adhered them to a piece of 12×2 white cardstock. After I had a few 12×2 strips, I trimmed them down into 2″ squares. When I had a little pile of 2×2 squares, I stitched down the center of each strip using white thread on my sewing machine. After all the stitching was finished, I began adhering the squares to my white background, diagonally on the left side of the layout. I added a photo of my kids and I on the right side of the layout. I used Thickers from the Sunshiny Days collection to create the title, placing it above AND below the photo. 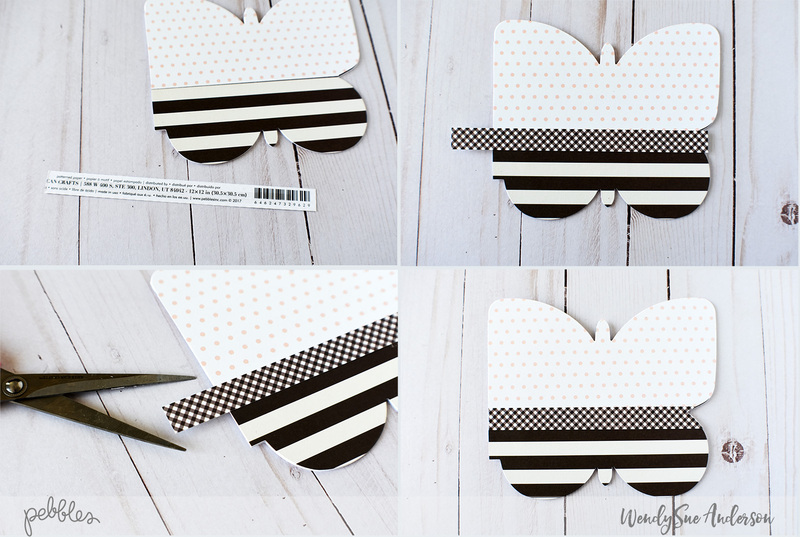 The journaling for this layout is simply printed on white cardstock, cut into strips, and adhered above the title. I kept the embellishments on this layout to a minimum so that the photo and the quilted squares could shine. 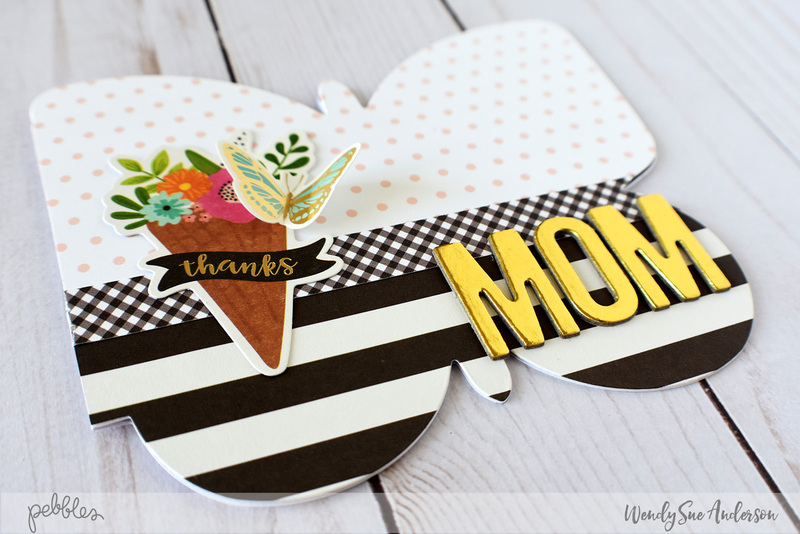 Once the Mother’s Day layout was finished, I had a few remaining squares on my desk and decided that I would make a quick Mother’s Day card as well, using only the leftover supplies. I LOVE how both of these projects turned out! 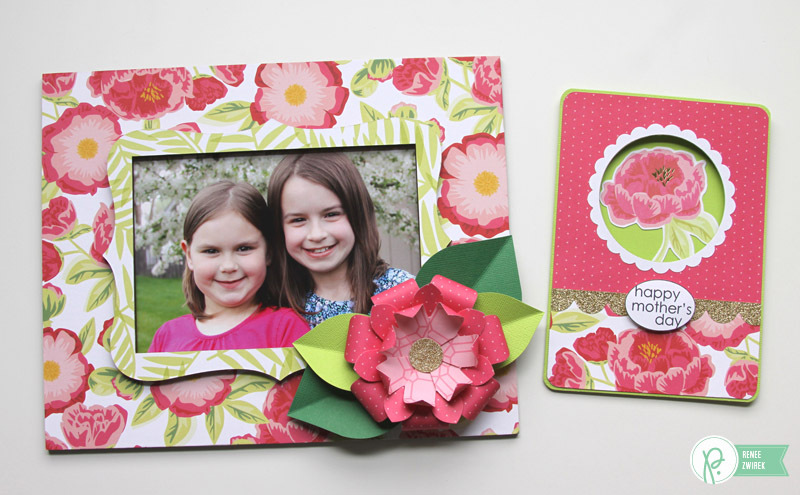 I hope that these projects inspire you to create your own Mother’s Day projects. Thank you for stopping by the Pebbles blog. Happy Mother’s Day! 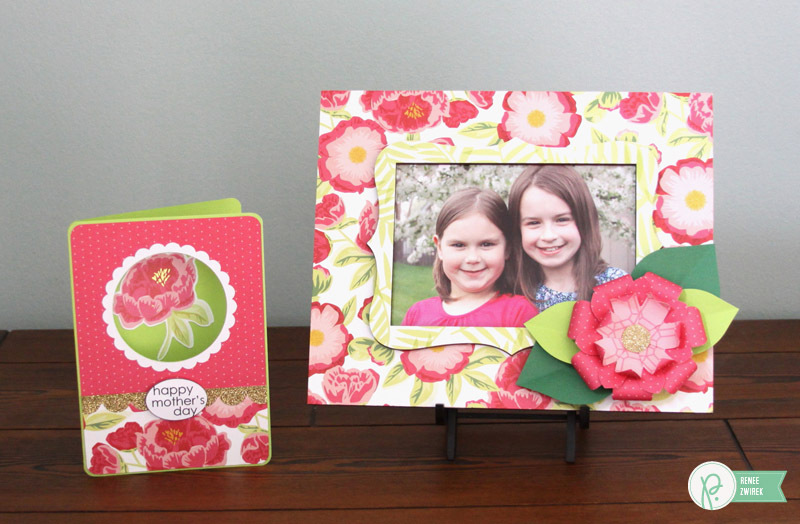 Hi, Renee here today to share a Mother’s Day Card and Frame Gift Set using the Jen Hadfield Everyday collection. I used this photo of my girls in a Spring layout a few weeks ago. I decided to include it in a gift for my mom since she doesn’t have this photo. I love this photo so much and I know she will too. The Layered Frames make a perfect gift! I’m so happy I hoarded it for a special project. 😉 As I mentioned before, my mom has an amazing green thumb. Since her garden always looks so pretty (and she loves the color green), I wanted to include lots of greenery and pretty flowers on this frame. 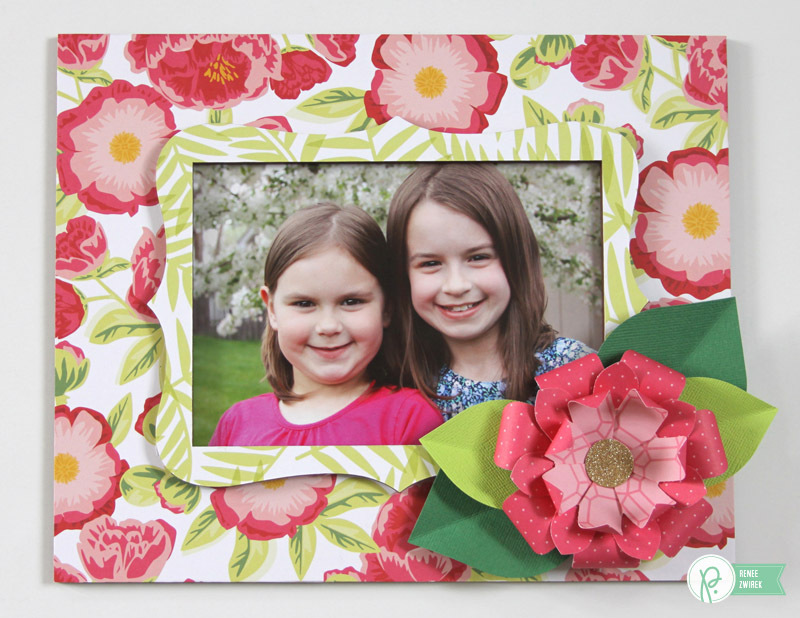 I gathered the Layered Frames, Pretty Peonies and Tropical Delight pattern papers, and some adhesive. I added adhesive to the photo part of the frame and used a brayer tool to make sure my Tropical Delight pattern paper was pressed flat against the frame. I trimmed the pattern paper using a craft knife and my Cutting Mat. I printed my photo to a 5″ x 7″, added adhesive, and trimmed around the frame again. I added adhesive to the 8 ¾” x 10 ¾” part of the frame and added the Pretty Peonies pattern paper to it. I centered my photo frame and adhered it to the base part of the frame. 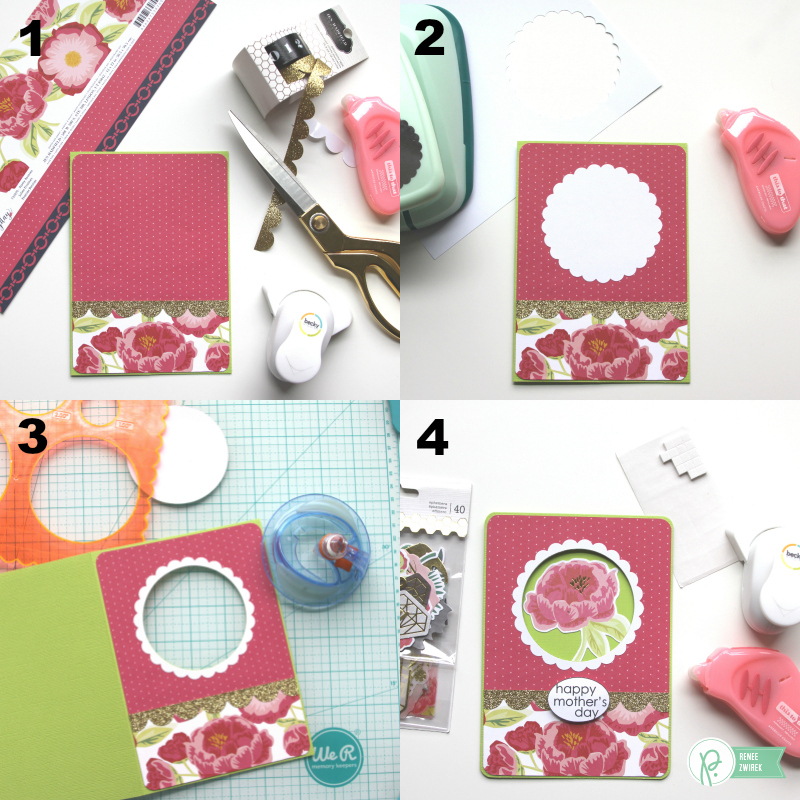 I gathered the Gemstones pattern paper, my Flower Punch Board, green cardstocks, and a gold circle stickers. I used both sides of the pattern paper to create the layers of this flower. I layered two XXS (3″ dia.) flowers with one XS (4″ dia.) flower. My two sets of leaves measure 2″ and 2 ½”. 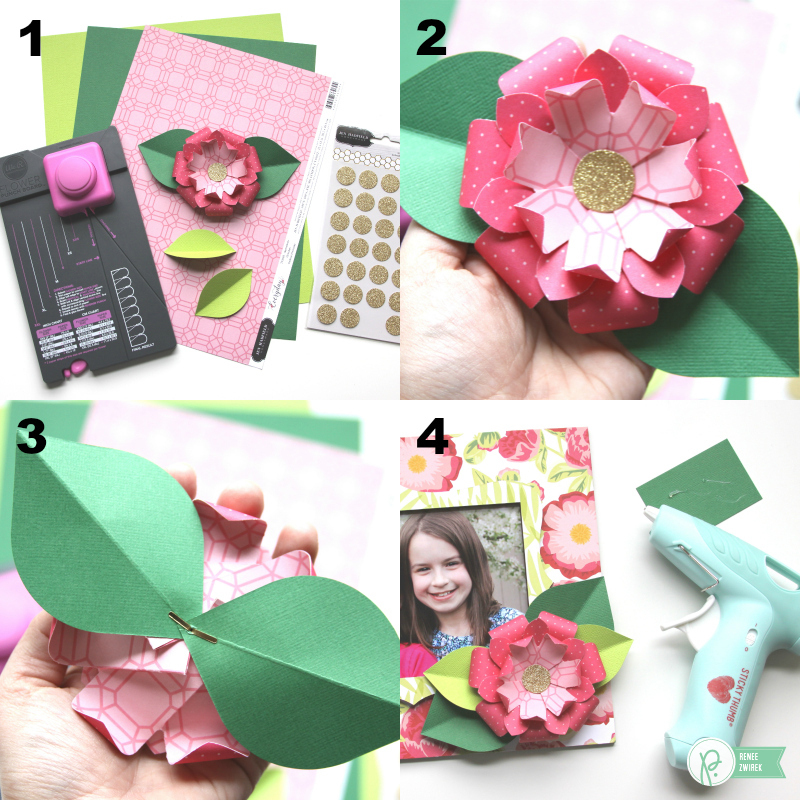 You can see how I made some paper flowers using the Flower Punch Board here. I used a brad to attach all the flowers layers together with the larger leaves. I used my Mini Hot Glue Gun to adhere my flower and leaves to the frame. All done! I made a simple window cutout style card. Inside is a pretty flower for my Mama and we’ll write her a special note. My card base measures 5″ x 7″. I trimmed a 4 7/8″ x 6 7/8″ piece of the Gemstones pattern paper and adhered a 2 ¼” x 4 7/8″ piece of the Pretty Peonies pattern paper along the bottom. 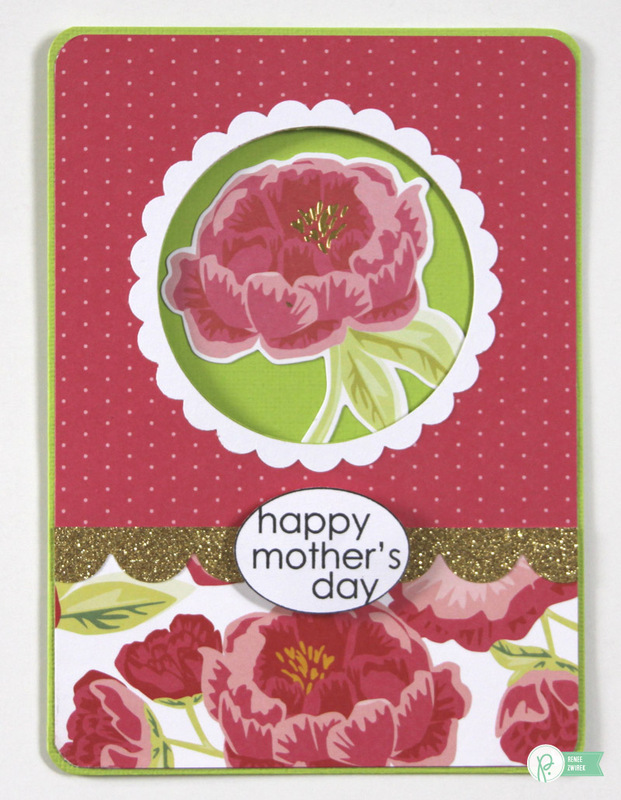 I added some Decorative Tape along top of the Pretty Peonies pattern paper. 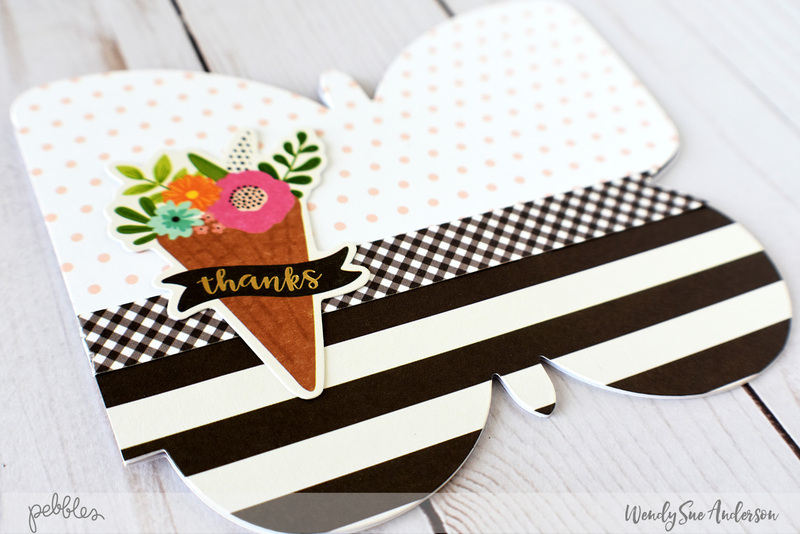 I used the corner punch before adding it all to my card base. I punched a 3 ½” scalloped circle and then centered and adhered it to the top portion of my card. I used a 3″ circle template and my Cutting Mat to create my window cutout. 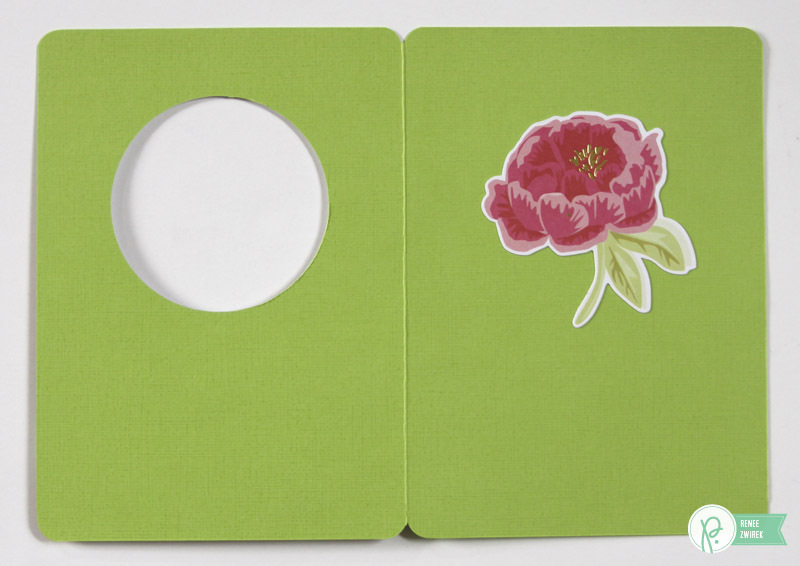 I adhered a flower Die-Cut inside my card and made sure to center it so it can be seen through the window cutout. 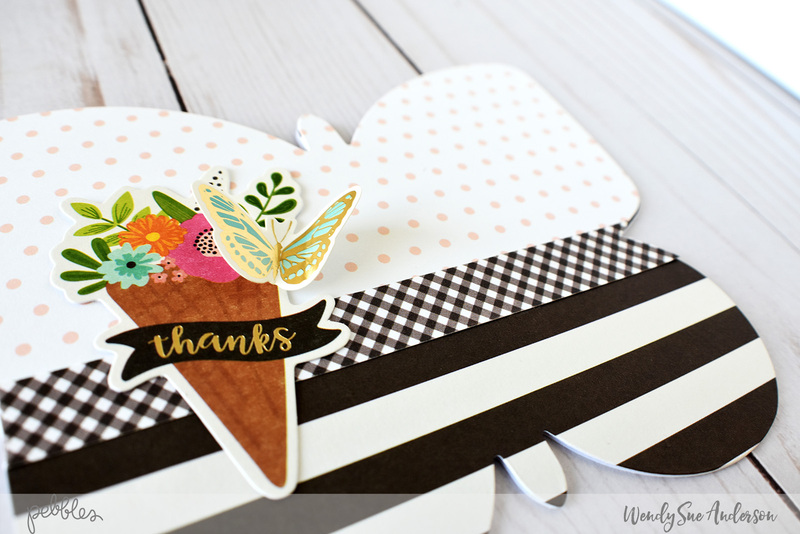 I used the corner punch on my card base and I added a stamped sentiment to finish off the card. 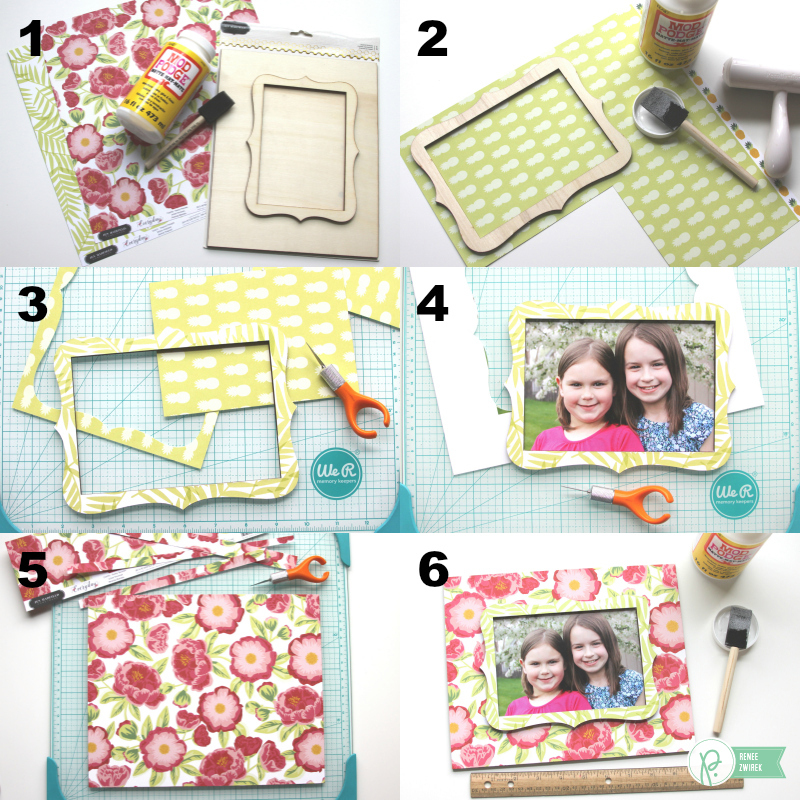 I love how this Mother’s Day Card and Frame Gift Set turned out! Can’t wait to give it to my Mama! Wishing you all a blessed and very Happy Mother’s Day! 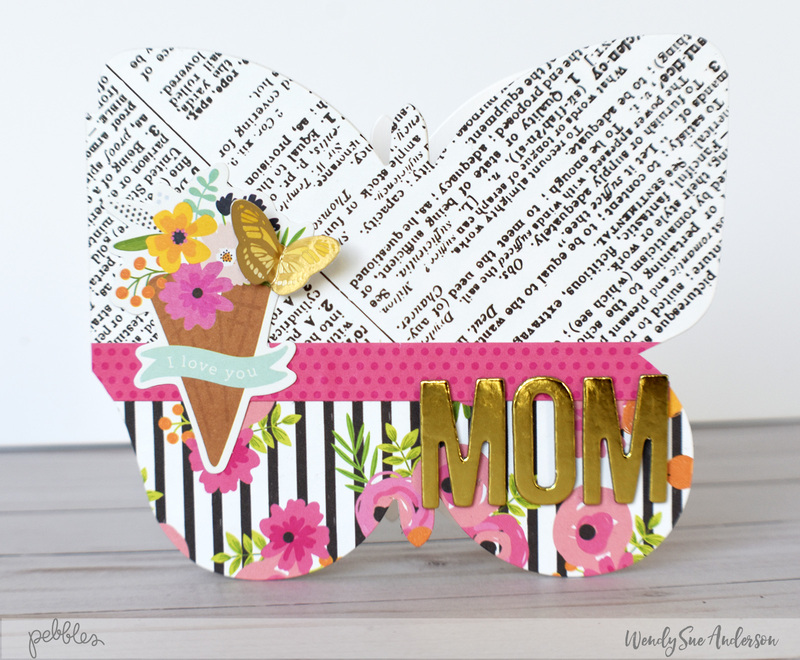 Head on over to my blog to see another Mother’s Day card idea using the Spring Fling collection. 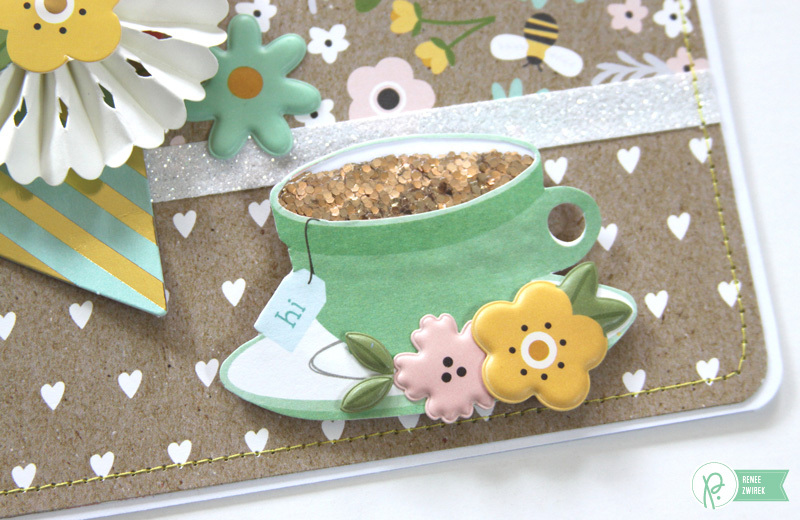 Oh my goodness, remember this adorable teacup die-cut shape from the Garden Party collection? It went perfectly with this card!